Like this video? 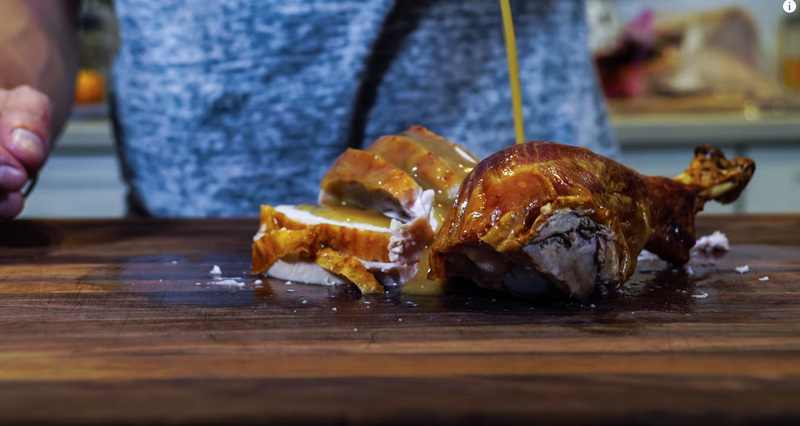 Subscribe to Not Another Cooking Show on YouTube for two new shows a week. 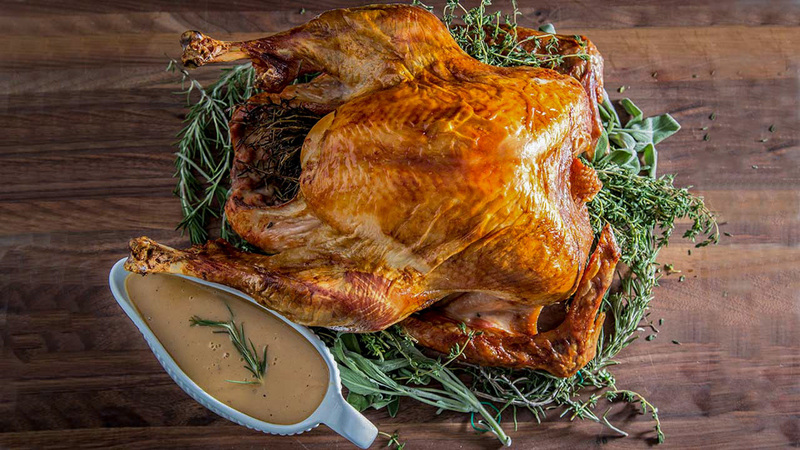 You’re going to need to get the turkey prepped and dry brined a day or two before Thanksgiving. Take the neck, gizzards, and anything else the bird comes with inside and use that for your turkey stock (link above). 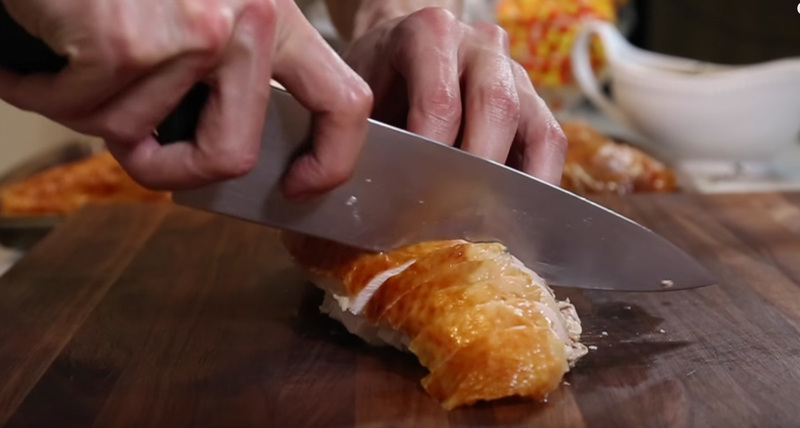 You can remove the wishbone if you want at this point, just scrape your knife along the wishbone to expose it, then kind of cut around it to loosen it from the meat, then just take your hands and just pop it out. 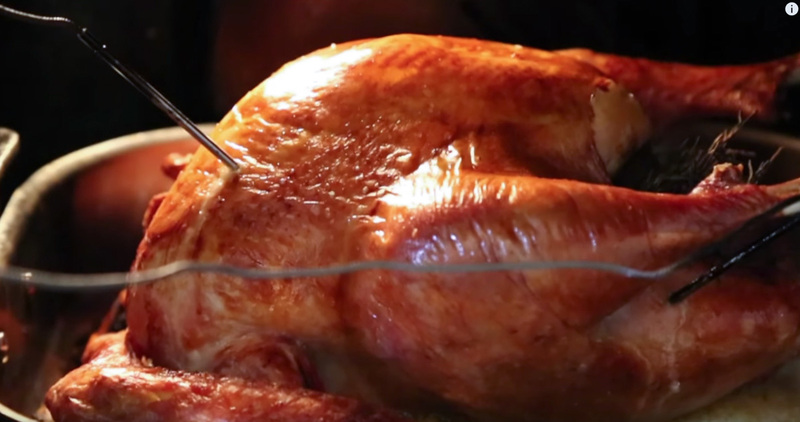 Removing this is optional, but will make it easier to carve the bird later. Next, we need to dry brine. Dry brining is going to do a few things. It's going to pull out the moisture from the skin and allow us to get it really crispy. The salt is also going to penetrate the meat over time, seasoning the meat throughout. 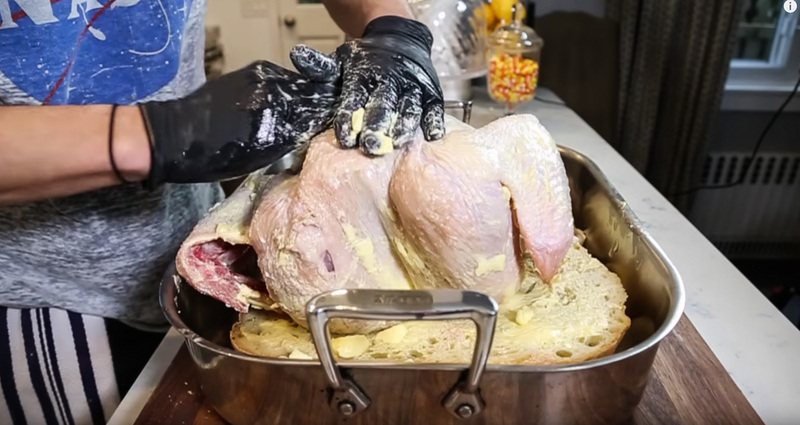 It will draw out moisture from the bird but it will then reabsorb it in a similar way that a wet brine does, with just less mess. The key to remember with dry brining is: use enough, but don't go overboard. I would strictly use kosher salt because the grains are bigger so you can see how much you are adding. Bigger grains are also less salty, believe it or not. So the rule of thumb is 1/2 teaspoon of kosher salt per pound of meat. And with a turkey, the breast is so much thicker than the legs so you’re going to want to apply most of the salt to the breasts and a little less to the legs and dark meat. So salt the bird with 6-7 teaspoons of kosher salt for a 12-14 lbs bird. Salt it all over the bird, hitting the skin and inside the cavity. Put it on a sheet tray, clean out your fridge to make sure you have plenty of space to put the bird, uncovered, on the bottom shelf of your refrigerator overnight. You should see the bird darken and the skin will start to dry up. The next day, take the bird out of the fridge at least an hour or two before cooking to take the chill off the bird and help it cook evenly. Before you are plan on getting the bird ready to roast, pat it dry to remove any remaining moisture on the exterior of the bird. Preheat the oven to 425 degrees, taking the top 1 or 2 racks out of the oven to create space. Take your Ciabatta bread and cut a thin piece off the top to create a flat surface on both sides. Then cut it in the middle to open it like a book, and flatten it out so there is a nice surface for the turkey to sit on. Then take a stick of butter, split it in half, and spread one half on each side of the bread. Then put it in the roasting pan, then transfer the turkey to the roasting pan on top of the bread breast side up for now. 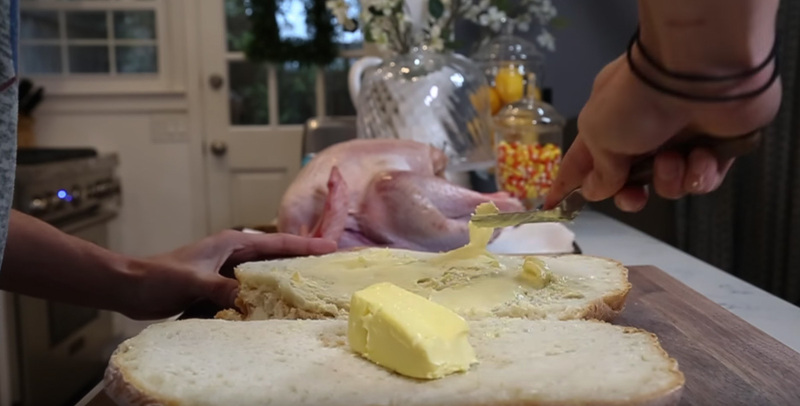 Then take the other stick of butter and begin to coat the entire surface of the bird thoroughly with the butter in every crevice. Stuff the bird with some thyme, rosemary, sage and half the lemon, then flip the bird and continue to coat the bird with the butter till completely coated. Then over the butter, lightly coat the bird with olive oil. Then just cut a head of garlic in half and the remaining lemon, and add it to the roasting pan. Now let's get on with cooking the turkey upside down! Roast the bird in the oven for 45 minutes, rotating every 20 minutes to ensure even browning. Remember, the breast should be resting on the bread at this point. The breast cooks faster than the dark meat, so but browning the dark meat first, we are giving it a head start, simultaneously basting the breast with juices and protecting it for the first half of the cook. Once the bottom of the bird is nicely browned, then you can flip it over. Carefully flip the bird right side up, and apply another light coating of olive oil to the breast to ensure it browns evenly. Then stick internal probe thermometers into the bird, one into the thickest part of the dark meat and one at the thickest part of the breast meat, making sure you don’t touch a bone. Pop it back in the oven, then drop the temp to 350 degrees, and cook the bird, while monitoring the internal temp until the breast meat reaches 155-160 degrees internal. By the time you flip it, the dark meat should clock an internal temp of around 140 degrees and the breast meat should be around 90. When you flip it, the breast will slowly catch up and close that gap. So you really don’t have to worry about undercooking or overcooking the dark meat, you just have to worry about perfectly cooking the breast meat. The final internal temperature of the turkey breast should be 160-165 degrees. When the breast gets there, the legs and dark meat should be around 185-190 and the entire bird should be evenly nice and golden brown and the skin should be like crackling. The bird will continue to cook when you take it out of the oven. It will rise at least 5-10 degrees. So when you take it out of the oven, let it rest for at least 30 minutes to 1 hour. DO NOT cover the bird right now. Just let it sit on a wire rack and a sheet tray. While it rests, take the bread out, which by the way, may be the most delicious part of this whole thing. I would literally bake in the oven till the moist parts crispy up and serve as toast. It truly is amazing. But regardless, get it out of the pan and remove the lemon and garlic. Then take a cup or two of your turkey stock, add it to the pan and deglaze it, scraping up all those delicious turkey juices and brown bits. Scrape it until the pan is clean, and then pour it through a strainer into your fat separator and let the fat separate. Then add the pan juiced to a bowl, or you could simply add it back to the container you poured the stock out of and set aside. Add the roasting pan to the stove and put the eat on to medium-low heat. Add 4 tablespoons of butter, 4 tablespoons of flour and the fat that you separated from the pan juices. 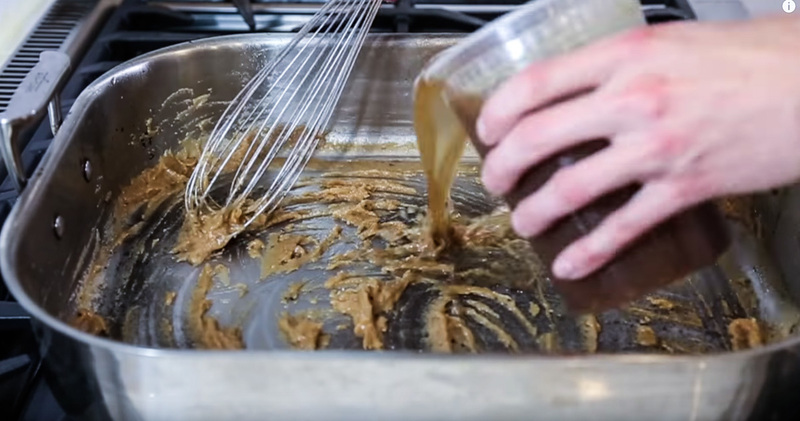 Whisk that all together to create a roux. BE CAREFUL NOT TO BURN IT. Just cook out the raw flour taste stirring constantly for a minute or two, then slowly add the stock to ensure no lumps form. Add 4 cups of your homemade turkey stock, stirring constantly until smooth and no lumps are present. Let it come up to a boil to get it to start to thicken. Add a sprig of rosemary and a squeeze of lemon juice and cook it until the just coats the back of a spoon and can hold there. Remember, when you take it off the stove, it will thicken even more so don’t make it too thick in the pan. 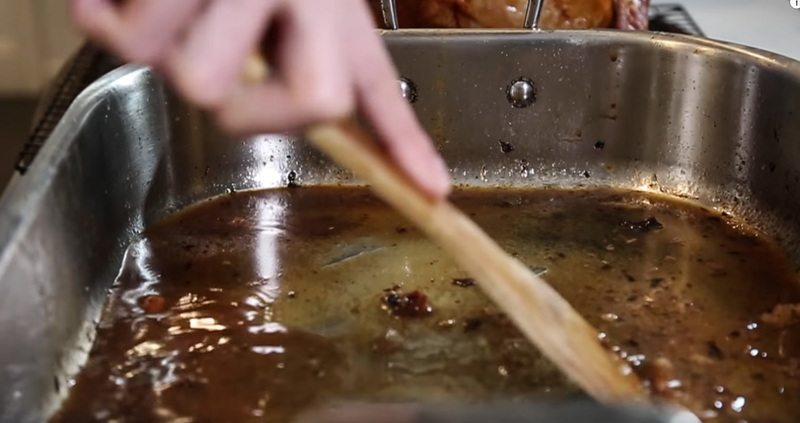 If you are using more stock on the big day, which I suggest you do, you just double this gravy recipe. 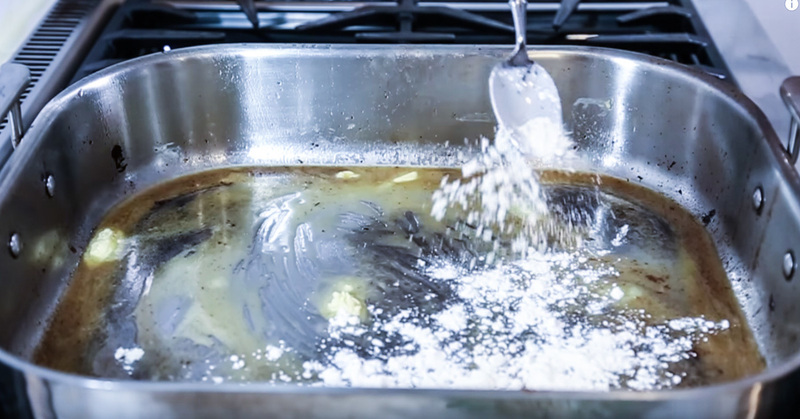 The ratio to make a roux is 1 tablespoon of flour and 1 tablespoon of butter for every cup of liquid being used. So with that ratio, you can make more or less than I made in the video and in this recipe. It will need to be seasoned at this point so make sure you add salt, and cook it for a minute let it dissolve and make sure that it's properly seasoned. Also add fresh cracked black pepper. Keep it warm until ready to serve, then pour into a gravy boat. 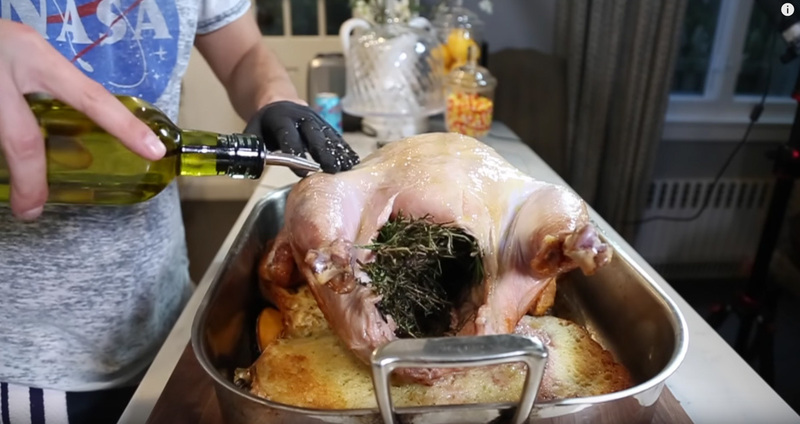 To carve the turkey, first remove the legs. Slice the skinny the joint to pull the leg away from the breast, then pop it out of its socket and cut it loose. Do the same to the wings. Remove the breast by slice just beside the breastbone, and just cut along the breastbone to remove as much of the breast meat as possible. Then slice the breast into slices so everyone gets a piece of the skin and against the grain. Then pull off the rest of the meat that you can including the oyster meat on the bottom of the bird and then add them to the bottom of your platter. On top of the less perfect pieces, Add all the browned perfect pieces on top, add a bunch of fresh herbs to brighten up the plate and add color. And there you have it, Thanksgiving dinner is served. Tell everyone what you're grateful for, and get eating. Happy Thanksgiving! Need a delicious side-dish to go with your upside down turkey? Try this amazing German stuffing recipe, which comes straight from my mom's kitchen to you, and is, we submit, the best turkey stuffing recipe ever.